By contrast, the breathtaking sea-girt caves and delightful islands nearby are ideal for exploring by kayak. This has to be one of the most enjoyable kayaking experiences in Southeast Asia. If you’re archaeologically-minded, there are also prehistoric rock paintings of human and animal figures at Tham Phi Hua To Cave. If you’re up for a rewarding jungle trek, you could do no better than head for Khao Phanom Bencha National Park, located 20km north of Krabi town. While there is no public transport to the park, it’s easily accessible by bike or car along well-maintained roads. The chief attractions here are several lovely waterfalls, including the Huai To Falls just 500m from the park office, that tumble through a series of 11 large pools. You’ll find them perfect for swimming, or just laying back and cooling off. Huai Sade Falls, about 1km further into the park, cascade over a high cliff. Khlong Haeng Falls are even more spectacular, crashing down about 500m from Khao Thep Bencha, the highest peak in Krabi province. If you’re feeling energetic, immerse yourself in the wilderness on the 16km trek through the wilderness to Ton Han Falls. 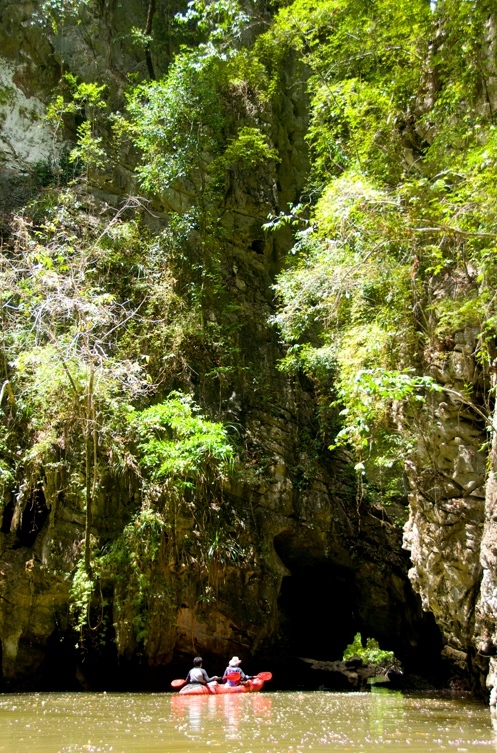 Another park attraction is Khao Phung Cave. Cool and quiet, you can enjoy the intriguing ambience resulting from the curious stalactites and stalagmites that the park authorities liken to mushrooms, curtains and pagodas. 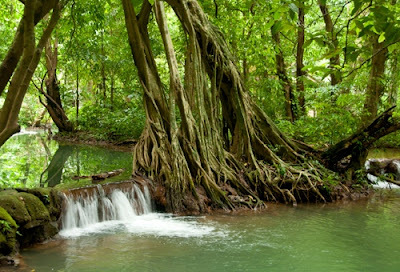 Another natural wonder for the ecotourist is the Pa Phru Tha Pom Khlong Song Nam reserve, a forested peat swamp traversed by channels of sparklingly clear fresh water flowing from Chong Phra Kaeo pool. This fresh water meets and mingles with sea water at high tide, resulting in an unusual ecosystem ideal for both mangroves and marsh-dwelling Lumphi palms, with their exotic exposed root formations lining the channels. 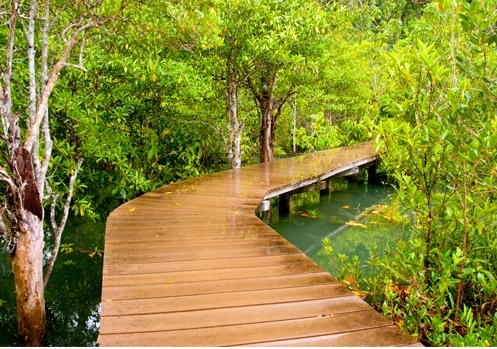 The reserve is ideal to explore by boat or on foot. Walking is safe and easy, with well-constructed boardwalks that have comfortable wooden benches placed at special viewpoints where you can quietly contemplate of the beauty of the place. Less demanding but just as entertaining is a visit to Khao Nor Chu Chi Wildlife Sanctuary and its excellent Tung Tieo Forest Trail. Renowned as a bird sanctuary where you may just see rare species such as the Black Hornbill and Gurnet's Pitta, the lowland forest area features a 3km nature trail to Tung Tieo Waterfall. There are 18 stations along the way with signboards that tell you all about the local wildlife and tree species. Two small and delightful freshwater lakes, the Emerald Pool and the Blue Pool, are ideal for a refreshing swim. Ko Klang, or “Central Island”, is a short distance across the Krabi River from Krabi town. Ringed by mangrove swamps, it’s most easily accessed by water taxi or a privately-chartered longtail boat. 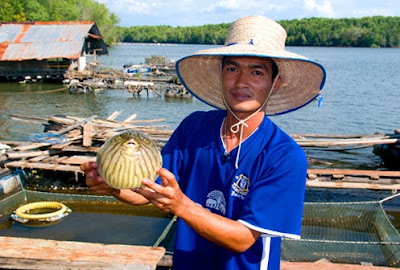 While the majority of visitors cross to the island for an hour or two to visit the mangroves, Ko Klang is also home to a quiet, mainly Muslim fishing community that warmly welcomes visitors. The community is an idyllic spot, and the people are as friendly as usual in Thailand. If you want to gain insight into the lifestyle and environment of southern Thai fishermen, boatmen, and their families, this is a very special place to stay for a few days. There are no resorts, but any of the travel agencies in Krabi Town will be pleased to arrange a homestay visit with a family on Ko Klang. The seafood is as fresh as could be and the nights peaceful and tranquil – this is one genuine Thai experience you will never forget. If you are looking to stay on one of Krabi’s many beautiful beaches, but somewhere more casual than Ao Nang or Railay, Hat Noppharat Thara might just fit the bill – and without having to go too far. Immediately to the west of Ao Nang, it’s a long stretch of sand lined with casuarina trees, offering with magnificent views of the massive karst outcrops for which the Krabi coastline is famous. This area is also noted for its fleet of brightly-painted fishing boats, a sure sign of an affordable feast of fine, fresh seafood at nearby restaurants. While you won’t find rows of umbrellas and deck chairs for rent on Hat Noppharat Thara, this undeveloped beach offers plenty of breezy, shady spots under the casuarinas. At low tide, you can wade through the warm, azure waters to tiny Pak Klong Island in the bay. 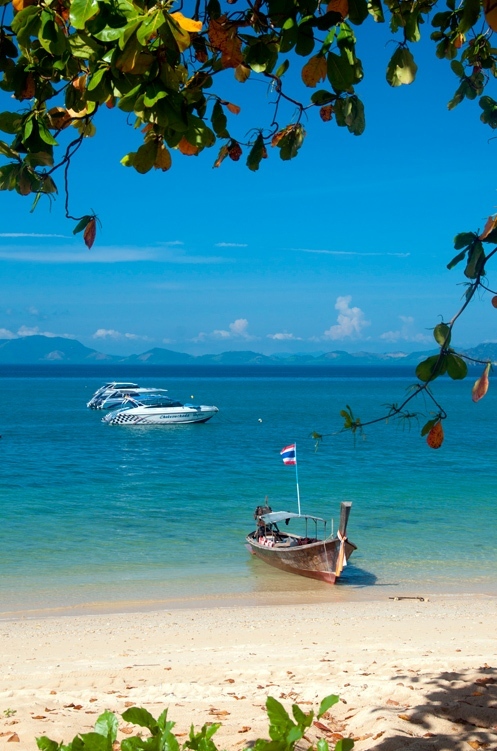 If you tire of getting away from it all, bustling Ao Nang is just a short stroll away. Well to the west of Hat Noppharat Tara, beyond Laem Hang Nak Peninsula, Hat Klong Muang is a more isolated beach facing west towards Ko Phi Phi. Here, the beach is well-shaded by casuarinas and coconut palms, and offshore islands add a fascinating profile to the horizon. Hat Klong Muang is gradually moving up-market from a backpacker destination to a cove with a cluster of higher-end resorts. It’s the ideal destination if you love the water, and is gaining an international reputation for great scuba-diving and snorkeling, as well as sea-kayaking to the offshore islands and beyond. These are just some of the areas off the beaten track of Krabi’s picturesque Andaman coast that offer unforgettable moments for eco-travelers. By going a little out of your way, you will see a green side of Krabi that few visitors get to experience. Getting to Krabi is easy. Krabi International Airport (KBV) is just 10km from Krabi town and has regular flights from Bangkok. You can also to reach Krabi by train via Surat Thani on the Gulf of Thailand coast, but you need to travel over to the Andaman coast by bus or private vehicle. Once in Krabi, whether you stay by the beach or in Krabi town, it’s easy to rent a bike or a car from one of the numerous hire companies. For the first-time visitor, it’s probably best to stay in Krabi town for a day or two to get the feel of this surprisingly relaxed and naturally beautiful province. Article brought to you by the Tourism Authority of Thailand (TAT).